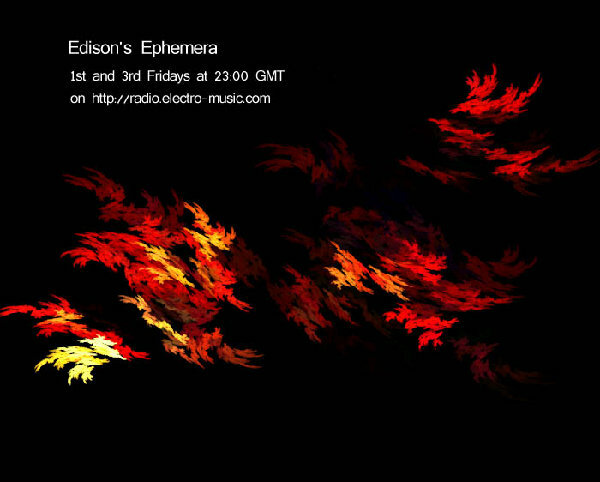 This show features music by EdisonRex. It might be live, it might be recorded, it might even be from a long time ago, but it will all be Edison's. Programs to be announced as they happen. Styles vary with mood. Anything can happen. Edison's Ephemera by Paul Harriman is licensed under a Creative Commons Attribution-No Derivative Works 2.0 UK: England &amp; Wales License. Based on a work at [b][i][color=#255293]radio.electro-music.com[/color][/i][/b]. Archive recordings of these shows may be found within this thread. Also in the media library. DAS KOMPUTERMASCHINE IST NICHT FÜR DER GEFINGERPOKEN UND MITTENGRABEN! ODERWISE IST EASY TO SCHNAPPEN DER SPRINGENWERK, BLOWENFUSEN UND POPPENCORKEN MIT SPITZENSPARKSEN. Discovered the notice on the top here at the last minute, and spent an hour snoozing to some nice music. I especially liked "Opus 56" (I think it was called), after which I gave in and fell asleep. Another Friday, another Ephemera. GMT 21h00 which is 10pm in the UK, 5pm in the US East Coast, and 11pm in Western Europe. you can catch up on old shows, http://electro-music.com/radio/archives/ currently has the archives, subject to change, afaik. And another Friday night arrives! Shameless plug for our three Friday night shows! Another Friday, more ephemera. This will be a build on the past shows, in that the Ephemera show is kind of like the endless soup pot. I build upon the past shows. And throw new things into the pot. This week's Ephemera will be an accompaniment to ambient recordings. I have been making increasing use of the Neuron as a sound source, and that will continue with this show. There will be some cameos of other parts of the studio as well. The show is entitled "Perseverance". "The Commute" - Environmental ambience with accompaniment. "Back Garden 1 and 2"
A combination of ambient backgrounds with electronic and acoustic augmentation. This one is pretty good with headphones. A selection of some old piano pieces of mine, interspersed with Klee-mania. Some of my piano stuff, and then some Klee and Space. The show alternated between mellow ambient and rhythmic electronic. There is some kalimba played by my son at the beginning. Much of this is Kleemania. Some notable timbres with the Wretch Machine. Klee sequences with various percussion, alternating with fairly spaced out harmonium+electronica. This was a pretty good show, as far as I am concerned. This used the PEK more than before, and the Neuron and Nord got used a lot. The whole show was improvised. This show was notable as foundations for the next few shows, interesting to see the evolution, if you work backwards from later shows. Second half of the show was some ephemeral Klee-based stuff. Just listened to the April 17th show. Marvelous! Some great sounds and compositions.